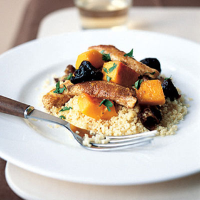 Serve with couscous to soak up the juices. Cut the squash in half and scoop out and discard the seeds. Using a sturdy peeler, remove the skin and cut the flesh into 1.5cm chunks. Mix the spices with a little seasoning and use to lightly dust the chicken pieces. Mix together the honey, orange juice and zest. Pour 300ml boiling water over the couscous in a heatproof bowl. Cover and leave to stand while cooking the chicken. Heat 2 tablespoons of the oil in a large non-stick frying pan and gently fry the squash for 5-6 minutes, stirring frequently until just tender. Transfer to a plate. Add the remaining oil and the chicken to the pan and fry for 2-3 minutes on each side until cooked thoroughly and there is no pink meat. Add the squash, prunes and honey mixture to the pan, and heat for 2 minutes. Fork through the couscous and spoon onto serving plates. Pile the chicken onto the couscous and scatter with the coriander.